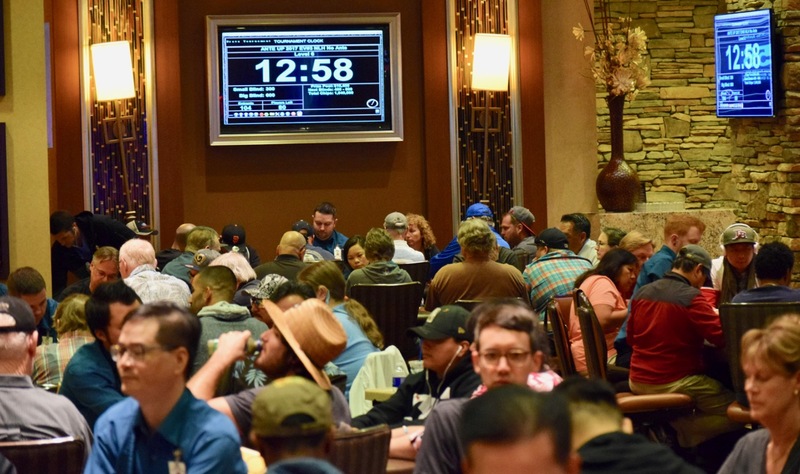 With more than 140 in Day 1C so far and 60 let in Day 1B, there's more than 200 player scattered throughout the tournament area. Here's a rundown of who we see in the event at this point. Rickey Evans, Rob Grossglauser, Jimmy Zeledon, Hieu Le, Duane Jarrett, Fred Anthony, Mai Xiong, Art Tanimoto, Bill Watchman, Jasthi Kumar, Srini Godavarthy, Cheri Svensen, Rafael Gonzalez, Tracy Oto, Juato Avalos, Chris Hinchcliffe, Travis Fujisaka, Brett Murray, Perry Paraskevas, Jeff Roy, David Stanford, Ed's Back, Jae Pak, Mike Harvey, Sean Burson, Monte Gilley, Marty Gorenc, Matt Boddorf and Mason Rosenberg.